Meridian Park Palm Beach Gardens townhomes is a subdivision of 2 bedroom, 2.5 bath, two story townhomes conveniently located in the heart of Palm Beach Gardens, right beside the renowned Palm Beach Gardens Medical Center and within walking distance of great shopping and dining. Built by acclaimed South Florida Builders, Divosta, in the 1970’s these homes are surrounded by palm trees and lakes. 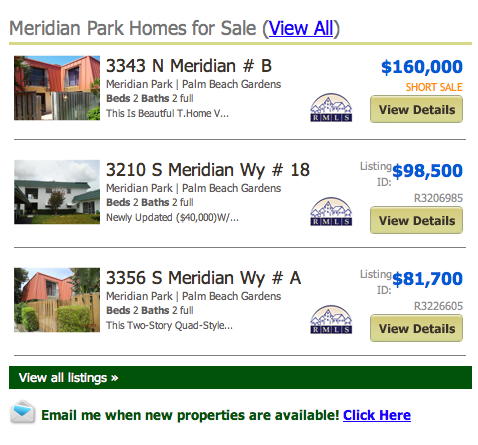 Meridian Park Townhomes online now. All listings & Sold Statistics! Meridian Park Palm Beach Gardens townhomes for sale is a hassle free place to live with low management fees of around $100 per month. The community consists of 169 townhouses in all. Private courtyards are a great way to enjoy the outdoors. All the properties have new metal roofs, which were replaced in 2010/2011. 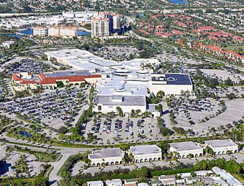 It is the perfect place to enjoy the South Florida lifestyle with a feeling of quiet and tranquility, right in the center of all the entertainment centers, with Legacy Place, Downtown at the Gardens and the famous Palm Beach Mall just a mile away. Only 15 minutes drive to Palm Beach International airport, 30 minutes to Palm Beach and an hour and a half from Miami. 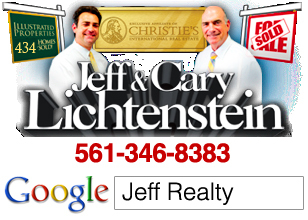 Posted in Palm Beach Gardens homes for sale, Uncategorized on September 29, 2011 at 2:16 am.